A Pink and Purple Bike (maybe with glittery streamers) Ever since I learned to ride a 2-wheeler bike I've loved the idea of biking, and over my lifetime have indulged semi-regularly. Other than riding to and fro friends' houses in my younger years, or recently resurrecting my bike for use while weekending at Whistler, I'm not a hard-core biker. Sure, there was the time I biked up to West Van's Cypress Mountain, then down a series of trails on my purple with pink splashes high-school special, or the time I biked down a long a dirt road in Peru--which I thought would be a breeze until I learned this in the middle of nowhere road was actually a highway and trucks were passing at 70km/hour. All this is to say, I like biking, but prefer a hybrid between mountain and road biking, nothing too extreme please. Getting from A to B Regardless of my fair-weather riding, I've always had a fascination with bikes as a means of getting from A to B, and have recently warmed up to the idea of adding biking to my transport repertoire. Seeing a gazillion people storm the streets on their two-wheels in China was really inspiring, and hey, if London can have a bike program with Quebec-made bikes, why can't Vancouver--a city known worldwide for its lifestyle-driven culture? Vancouver's Bike-Share Rental Program After taking part in Montreal's bike program during a recent visit (pictured above), I once again became enamoured with the idea of bikes. 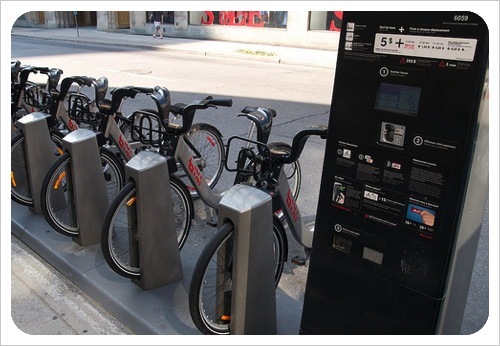 Montreal's Bixi (bike + taxi = bixi) program made biking easy, accessible and cost-effective, which is why I was ELATED to find out Vancouver's getting a bike program in 2011. The Details I can already see program prep taking shape all over the city with the expansion of the already extensive bike lanes and routes extending over 400 km. If Vancouver wants to be a green example to the world, becoming more bike-friendly is a significant step in the right direction. Cost $78/year + fees for trips lasting longer than half an hour. I also suspect there will be a +/-$5 day-use fee like they have in other cities with bike programs. Bikes There are 2000 bikes planned. If the city's program borrows any wisdom from London's bike-hire planning, the bikes will be customized and outfitted for Vancouver's geography, climate and ridership trends. Stations 200 stations are planned all over the city in neighborhoods like: Mt. Pleasant, Kits, Fairview and Downtown with likely stations in Commercial Drive and at UBC. 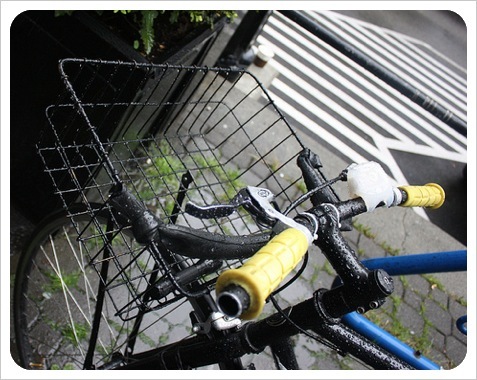 One question: As a Vancouverite, I don't think it rains here that much---others may disagree---but will the upcoming Bixi bike system have built-in bike umbrellas or ponchos? Now that would be cool.